SYDNEY, Australia - Five different try-scorers and a full-team performance against Canada secured an HSBC Sydney7s Cup Quarterfinals berth for the Men's Eagles Sevens in a 31-19 victory Friday (U.S. time). The Pool D match at the fourth round of the 2016-17 HSBC World Rugby Sevens Series marked the first time the border rivals have faced each other this season, just one week after the neighbors to the north finished fourth at HSBC Wellington Sevens. The U.S. will confirm its seeding with their final pool match against Russia at 2:23 a.m. ET Saturday. World Rugby's website has made the live broadcast available to viewers in the United States. Both squads entered the field of play with the intensity of a Cup Final though Canada's kickoff was delayed to the match official's mistiming. The Eagles received the kick but lost the ball to a tipped pass, which Canada turned into the opening try through Justin Douglas for a 7-0 score line after 60 seconds. The Eagles were smart in not playing the ensuing restart that did not travel 10 meters, receiving a tap at midfield. Carlin Isles was shut down on one wing for the U.S. to swing it the other way, where Danny Barrett relished the opportunity to take on the two defenders in his way. Barrett stepped out of one tackle while simultaneously pushing off Harry Jones on the try line to center the score, tying the match at 7-7. Martin Iosefo and Folau Niua each tried to put the ball in behind the defense with their boots in the fifth minute, with the latter's blocked prior to Isles being beaten to Iosefo's in the corner. Barrett disrupted one Canadian lineout 15 meters from the line before Andrew Durutalo grabbed the ball from the next to start the Eagles' attack. Isles ran between two defenders near the corner and got the offload out to Iosefo for the go-ahead score at 14-7. Play continued past the seven minutes on the game clock, with Isles pressured by a poor pass on the wing. Mike Fuailefau could not get away from the speedster in the attacking half, but Caleb Jordan offered support to send the teams into the break the way they started it: even at 14-14. The second half was all Eagles, beginning with the restarts. Barrett and Stephen Tomasin watched a lifted Canadian drop the ball on the first kick of the second half, and Barrett drew two defenders following the scrum to feed Durutalo for the try in the corner. Madison Hughes dotted down in the same spot when the Eagles stole the next restart; Niua's patented dummy and Barrett's strength opened a hole for the captain to increase the lead to 24-14. Head Coach Mike Friday let Don Pati in on the action in the 12th minute as the Eagles again kept Canada from the ball, and the University of Utah graduate skipped away from three defenders at the U.S. 10 for a 31-14 score line. Matai Leuta was hard-done-by with his first touch on the next restart, leading to John Moonlight scoring a consolation try for a 31-19 final score. The Eagles, on six pool points atop Pool D, will finish pool play at Allianz Stadium against Russia at 2:23 a.m. ET Saturday. Argentina and Canada are each on four points with a head-to-head to play, which will help to determine the U.S.'s seeding for the Cup Quarterfinals. 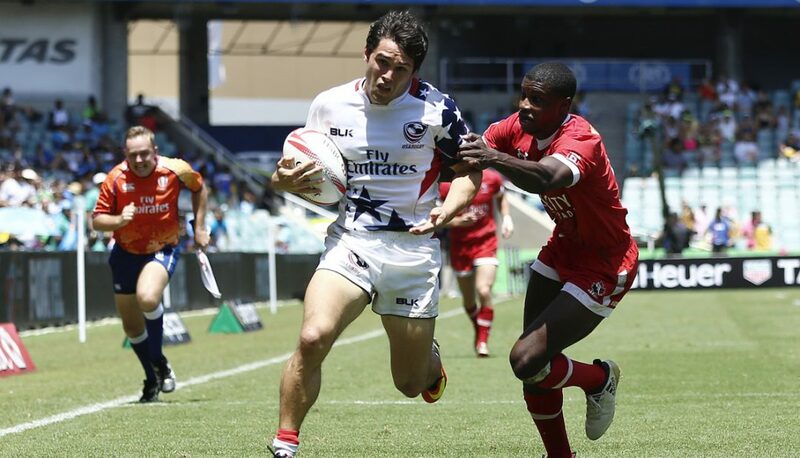 Sydney7s can be watched live in the United States on World Rugby's Sevens Series website.